Headphones have become an integral part of our everyday communication modes, evolving dramatically from long wired beings to compact Bluetooth-enabled ear clip-ons. While it’s physical attributes are still undergoing a metamorphosis, there’s a deeper research activity occurring to power headsets and offer an absolutely noise-free experience. Researchers initially dabbled with passive noise cancellation technology by employing a special material or structure that could cancel ambient sound (noise) from the outside environment. However, there were certain frequencies that the passive technique was unable to identify, such as those made by trains and airplanes. A growing need for a noise-free hearing experience led to intense research and development of active noise cancellation (ANC) or active noise reduction headphones. ANC headphones use a specific in-built circuitry to cancel unwanted ambient sound. These headphones are fitted with a microphone that receives this ambient noise. This noise is analyzed by a special circuitry that generates a sound signal of exactly the same amplitude and frequency as the unwanted ambient sound signal. However, this new signal is inverted in phase (i.e. 180° out of phase). This out of phase signal is then transmitted back into the air through a speaker located on the ANC headphones. Both signals (the unwanted sound signal and the signal generated by the ANC headphones) combine to cancel out each other because of opposite phases. 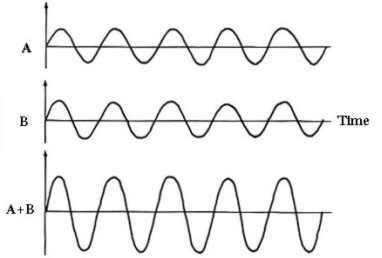 This process is named as Destructive Interference. The makers of active noise headphones claim that after wearing them the user will not hear any external ambient sound irrespective of any sound streaming through the headphones. Now the problem with ANC headphones is that sometimes you also miss out on important sounds or calls. For instance, the user may miss listening to the phone ring or a vehicle sounding its horn while walking down a busy street, or maybe even someone ringing the doorbell. In a bid to solve this complication, Amazon recently patented (US 9398367 B1) an ANC headphone that suspends or halts the noise cancellation circuitry on receiving a specific word or set of words. While it has the elements of a regular AMC headphone, Amazon’s headset includes an I/O interface (wired or wireless) for user interaction, a memory, a keyword spotting or recognition unit and a noise cancellation switch. A user can input specific keywords or set of keywords into the memory of these headphones which can be spotted by the keyword spotting unit. The keyword spotting unit continuously monitors the external sound for these stored keywords. On finding a match between an external sound and the stored keyword, the noise cancellation is suspended or halted and the user is able to listen to the external sounds. The keywords can be anything such as “hello”, “hi peter”, “lunch time”, “meeting time”, etc. The noise cancellation circuitry gets activated after receiving a valid signal from the user that can be an audible signal or an electronic signal. Some claims of the patent US 9398367 B1 were rejected under U.S.C. 35 102(a) to a patent application US 20140064511 A1. This patent application belongs to Qualcomm Incorporated and it discloses similar features as claimed in Amazon’s patent US 9398367 B1. The US 20140064511 A1 claims a method of receiving an announcement through a microphone located in the active noise cancellation headphones and identifying whether the announcement is relevant to the user, using an internal processor. In case the announcement looks relevant the headphones circuitry suspends the current audio output (current music or songs) and play the recorded announcement. There are more than five thousand patents pertaining to the noise cancellation headphones. Sony holds the maximum number of patents in this field. After Sony, the companies like Audio Technica, Apple, Panasonic, Motorola, and Bose line up. With these patents coming into play, noise-free headphones are all set to amplify the hearing experience. Vishal is a patent analyst with a flair for robotics, microcontrollers, microprocessors and FPGA. He enjoys astrophysics and assembling self-assigned electronics projects. Thanks fro writing it to the best of what you can thought it’s too technical. Great writing! Excellent Blog!! I came across your blog, and here I find most valuable and technical information. You write very well. Thanks for sharing this kind of information.